These two pottery markets takes place every August, organized by “Tour d’Argile”, a small association of professional potters based in Llauro. Associated with the National Collective of Ceramists, this event has become two of the biggest craft dates on the region’s calendar. 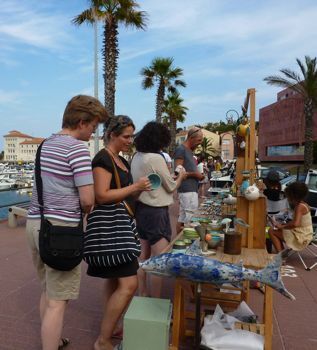 Every year 30 potters from France and abroad are chosen according to strict criteria on quality and originality. Displaying clay in all its forms, the public is guaranteed to find talented craftsmen or women, presenting unique and inspiring pieces. Raku, earthenware, stoneware, crystallization, utilitarian and ornamental objects, sculptures… the range of ceramics on offer is truly a spectacle to behold. The public can cast their vote for their favourite potters and have the chance to win a voucher to spend on the market or in St Roch gallery.